We've written a lot about American Expedition Vehicles here, so when we were offered a little seat time in the Brute Double Cab, a converted Jeep Wrangler Unlimited, of course we jumped on the chance. A Jeep truck, like stuffed crust pizza and Thursday Night Football, just makes sense. Chrysler has been teasing the idea of a Wrangler-based pickup for years. They're not opposed to doing it. But there has to be a business case built around it addressing demand for a vehicle and the logistics of assembling, marketing and selling them. There is a Mopar kit available, but you have to do the work yourself. AEV offers its own conversions so you don't have to. And they do it well. I drove AEV's Brute Double Cab this week around their headquarters in Wixom, about a half-hour away from Detroit. I didn't get a chance to go off road, unfortunately. But there's no doubt that the Brute Cab is capable. Let's talk a little bit about AEV's history, first. Its founder, Dave Harriton, was a student at the University of Montana and Wrangler owner. He stretched the wheelbase of his own Wrangler, which turned some heads around town. People asked him to convert other cars. Harriton, in need of an entrepreneurial idea to fulfill a capstone course in management (that also offered seed money to the winning idea), pitched the concept of truck conversions. He won, and established a base in Montana. That was 1997. Harriton steadily modified Wranglers one by one, expanded his staff, built a relationship with Chrysler and established a larger operation closer to Detroit. Everything AEV needs is in a 200-mile radius of its headquarters, including the Wrangler assembly plant down in Toledo and, of course, Chrysler's headquarters in Auburn Hills. AEV was able to hire two former Chrysler engineers who worked on the Wrangler to give insight about all the nuts and bolts about the Jeep. And Chrysler themselves began sending pre-production Wranglers to AEV before the public got a chance to see whatever was new for each model year. That brings us to the Brute Double Cab. AEV is on track to sell about 600 Brute Cabs since it has been in production. People want this thing. When I drove it, I saw why. First, AEV stretches the wheelbase of the Wrangler Unlimited 24 inches between the wheels and add an additional 16 to the rear of the frame. Then they chop off the back for the pickup bed. They replace the hood with their own crafted hood (made from local steel) that still meets Chrysler's crash-test standards. They add bigger tires, a winch, their own steel tailgate, their own composite bed, seven gallons of water storage, new bumpers and a custom interior that makes this an AEV, but doesn't stray too far from Jeep's vision. What sets the Brute Cab apart is its suspension. With the help of the former Chrysler engineers, AEV builds its own that integrates seamlessly with the Wrangler's original assembly. And, of course, that it looks exactly like the Wrangler truck that was always meant to be. AEV uses the 3.6L Pentastar V6 that comes standard in the Wrangler, or can drop in modified versions of the 5.7L V8 HEMI or the 6.4L V8. The 6.4L is for power and fun, AEV says. The 3.6L is the more economical choice. The 5.7L bridges the gap. I drove the 3.6L. It's a quiet beast on the road. It adds about 200 lbs. over the base Wrangler Unlimited, but you don't feel it. The suspension is tuned for off-roading, but also for a comfortable daily drive. I was surprised at how plush the easier drives were despite its intimidating appearance. To Chrysler's credit as well, the 3.6L was still able to push the Brute along just as well as it would have in the Wrangler, and shifting was smooth as we ably reached higher speeds. AEV can put in a manual for you purists, just so you know. But don't knock the auto. If there's one mild complaint to be had, its the lack of a sidestep since the Brute is so far off the ground. That's obviously bad for off-road conditions. But it's a tricky maneuver getting in and out nonetheless. 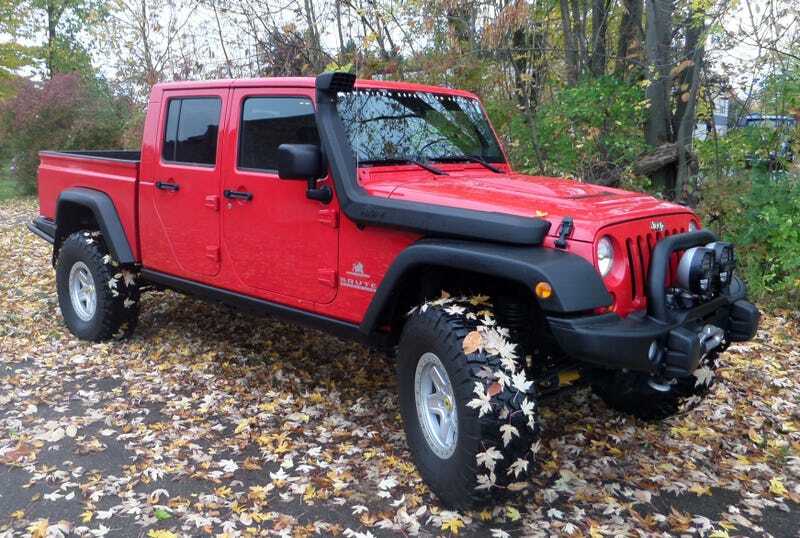 AEV has only been converting Wranglers so far. But this year at SEMA, they'll be debuting an all-new modded Chrysler product. AEV wouldn't tell me which one it was. My guess is its a Cherokee, but we'll see. And because they're doing so well, AEV is moving to larger facilities in Metro Detroit to accommodate demand. So, want one now? There are 60 AEV dealers nationwide and counting. Go get one. And have fun.